Carrier Oils – A General Reference | Nascent Naturals Inc.
Carrier oils are also known as “fixed or vegetable oils.” A fixed oil is a compound of glycerol and a fatty acid. They are called fixed oils to distinguish from an essential oil, which evaporates when in contact with the air or when it is heated. We only sell carrier oils from vegetable source. They are cold pressed where possible. They tend to go rancid with prolonged exposure to the air due to the oxidization of the glycerol, which then destabilizes the fatty acids. Oils high in unsaturated fats tend to go rancid much quicker than those containing saturated fats such as coconut oil. They also have different levels of stability and shelf life depending on factors such as exposure to heat, for manufacturing or addition of essential oils. We sell what we feel are the most stable yet natural grades of carrier oils since we cater to the aromatherapy, massage therapy, and natural cosmetic and product manufacturing markets. In some cases several grades or types of certain oils are available to satisfy buyer requirements. The nuts, seeds, etc. are placed in a large press and ground down under tremendous pressure until the oil releases. Although carrier oils should be cold pressed for use in Aromatherapy, this term can be somewhat misleading. Cold pressed simply means that no heat is added during the extraction. When heat is added, more oil will be extracted giving a higher yield. This is why cold pressed oils tend to be more expensive. Unfortunately, when you compress anything, there is a natural build-up of heat and friction. True cold pressing involves shutting down the presses when temperatures exceed industry standards for cold press which is usually around 110° F.
This method of extraction can be applied to almost any plant material that is gathered and mixed with a carrier oil. The mixture is left in sealed glass jars for 3– 6 weeks with periodic agitation. Many types of oil are left in the sun to let nature assist absorption of the the plant properties into the oil. During this time medicinal properties and molecules from the plant are absorbed by the oil, which acts like a natural solvent. It is then filtered to separate the oil from plant material. Only oils high in unsaturated fats such as olive, grapeseed or sunflower are suitable to obtain best results. Oils such as coconut or jojoba are not effective in these situations. Maceration is quite common with plant extracts that cannot produce a stable oil yet have excellent healing properties. All carrier oils are to be stored in cool, dark places or in some cases refrigerators. Some carriers will congeal at low temperatures such as coconut, avocado or neem, but it does not adversely affect them. At room temperature most will return to liquid. The bottle should be tightly capped. 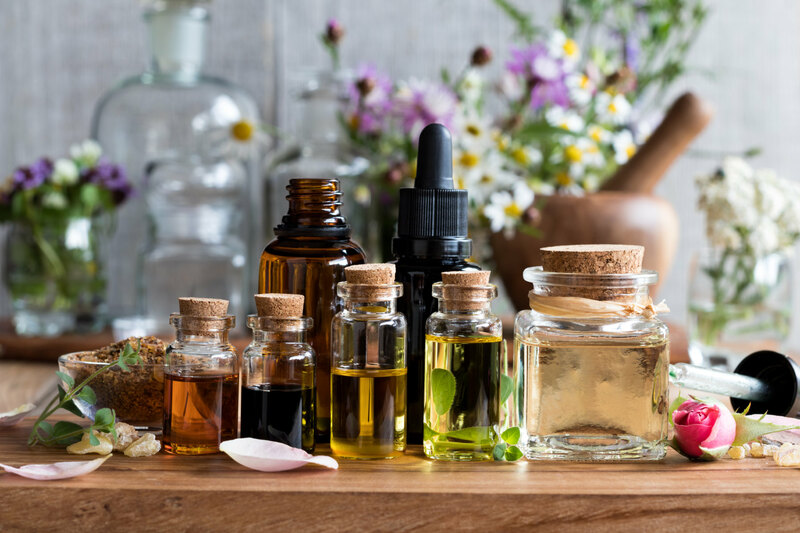 If you purchase large quantities for therapeutic use, keep only a small amount (6 – 10 oz) on hand in a smaller bottle with the rest stored away. Exposure to air and, in some cases high heat are what can most easily destabilize vegetable oils. Some carrier oils will develop a rancid smelling film around the cap and neck of the bottle. This is normal and unavoidable due to the residue from usage exposed to air. If you suspect your oil has “gone rancid”, pour a small amount into a cup and smell. If it is fine, you just smelled the rancid residue around the lid. Too many people waste oil by not doing this first. To maintain purity and freshness of carrier oils, do not mix essential oils with carrier oils until intended use. Essential oils will begin to oxidize the vegetable oil. This is unavoidable but can be slowed down with the addition of an anti-oxidant such as wheatgerm oil or pure vitamin E. Two notble exceptions to this are coconut and jojoba oil which are very stable and do not oxidize. This makes them the most suitable for mixing with essential oils for commercial products such as bath oils, perfumes and dilutions with precious oils such as rose. Fixed or carrier oils are not soluble in alcohol or water. An ideal carrier oil for use in Aromatherapy is usually odourless and absorbs easily into the skin. It should also contain nutrients that provide nourishment or contain fatty acids which are close to the chemistry of our own skin such as coconut or jojoba oils.